In an article in the Seattle Times on December 17, 2007, reporter Amy Roe discusses the benefits of "Quiet Pavement", or "Rubberized Asphalt" (RA). "Highway 520's sweet spot — a sliver of freeway near the eastern end of the Evergreen Point Floating Bridge — is so smooth and quiet even an ancient Geo Metro feels like a first-class cabin. But to Walter Scott, those 2.25 miles between Hunts Point and Medina sound a lot like success. Thanks in part to Scott's advocacy, the state Department of Transportation (DOT) is testing materials there designed to turn down the din of traffic. The DOT calls them "quieter pavements." Those who drive the highway or live nearby call it a huge improvement: "People who live along 520 are like, 'You are a godsend,' " Scott said." "Although the federal government doesn't recognize pavement types or textures as a form of noise mitigation, that hasn't kept asphalt rubber from oozing into California, Arizona, Texas, Florida, Alabama and Georgia. Washington joined them in August 2006, paving 1.07 miles of asphalt rubber and an additional 0.77-mile strip of polymer-modified asphalt on southbound I-5 in Lynnwood, alongside conventional, dense-graded asphalt. In July of this year, the Washington state DOT installed similar test sections on Highway 520, between Hunts Point and Medina. Next year, the agency will do more testing on I-405 in South Bellevue. That project will include 1.25 miles of rubberized asphalt and 1.25 miles of a polymer quiet pavement on northbound I-405 from Southeast Eighth Street to Coal Creek Parkway and southbound from I-90 to Coal Creek Parkway." Walter Scott would be the first to say that numerous people have been involved in bringing about Washington State's use of Rubberized Asphalt (RA), or Quiet Pavement. But remember the example of what citizens can achieve if you do your homework, you form partnerships of like-minded people, and like Walter Scott, you are persistent. The Wall Street Journal reports that: Minnesota spends $1.6 billion a year on transportation-but nearly $1 billion of that has been diverted from road and bridge repair to the state's light rail network that has a negligible impact on traffic congestion. Last year part of a sales tax revenue stream that is supposed to be dedicated for road and bridge construction was re-routed to mass transit. The Minnesota Department of Economic Development reports that only 2.8% of the state's commuters ride buses or rail to get to work, but these projects get up to 25% of the funding. Seattle should prioritize transportation dollars to replace the Alaskan Way Viaduct and the 520 floating bridge FIRST, before considering expensive light rail projects that, at best, would only serve 2-3% of future transportation trips. "Some things in politics seem to be inevitable -- and one of them is that any road or bridge tragedy will be followed by an argument to raise the gasoline tax. That's what is now happening in the wake of the terrible Minnesota bridge collapse, but that state's transportation and tax record shows precisely why voters are skeptical." “Minnesota's transportation auditors warned as long ago as 1990 that there was a "backlog of bridges that are classified as having structural deficiencies." In 1999 engineers declared that cracks found in the bridge that collapsed were "a major concern." Bike paths were deemed a higher priority by Congress, however, including its powerful Minnesota Representatives. "Medina City Manager Mark Weinberg said the Department of Transportation came to the city with the plan for quieter pavement, which was installed during a maintenance closure of the Evergreen Point Bridge. "The initial reaction is that people are absolutely delighted," Weinberg said. WSDOT plans another test in Kirkland next year. However, "she (Mia Waters) said it will be at least eight years before transportation officials decide if the new pavement is wearing well." 8 years is a long time to exclude RA from roads projects where it could be reducing road noise and raising the quality of life for Washington taxpayers. RA has been used successfully in Arizona in conditions with snow and ice for almost two decades, as well as in California, British Columbia, and in Europe. Let's hope WSDOT's bureaucratic La Brea tar pit can be eliminated so that Washington residents that live near freeways can benefit from proven noise reduction technology that has already been used in Arizona for 16 years without failure, and which has endured the effects of snowplows and tire chains. "will prepare a 1.6 mile section of roadway for installation of rubberized asphalt and open-graded polymer, on State Route 520 between Medina and the Bellevue Way intersection." (Walter) "Scott organized a collection of communities — including Beaux Arts, Redmond, Medina and Mercer Island — which have pushed the state to study the benefits of quiet pavement." Those efforts prompted city officials, like Bellevue Mayor Grant Degginger, to press state officials to perform more extensive testing and use of quiet pavement technologies. “In (some) cases, traditional noise abatement techniques, such as noise walls, do not mitigate highway noise impacts and alternatives are not permitted by state policy and federal guideline,” wrote Degginger in a letter to Gov. Christine Gregoire last year." “It can be laid here by people who know what they’re doing and have the right experience,” he (Walter Scott) said, noting that a major rubberized highway in Arizona has existed for 17 years. 3. Cost savings for Washington taxpayers. Kiro News just reported that data from the "good to go" transponders on the Tacoma Narrows bridge will be held for 8 years and will be available for subpoena. The DOT site confirms this big brother aspect to the tolling technology. See the article on the website for the Reason Foundation that "produces rigorous, peer reviewed research and directly engages the policy process..."
The following excerpt describes a similar condition to that of the Seattle/Bellevue/Eastside area- we do not have the density of Paris, Hong Kong or Barcelona that is necessary to draw enough ridership to justify the staggering cost of light rail in our region filled with lakes, hills, protected wetland areas, glacial till and fault zones. We have single family homes and suburbs. Light Rail will not serve our communities in a cost-efficient way and will not provide enough congestion relief to justify the cost. "The lower a city's density, the harder it is for rail transit to be successful. And you won't find many major metro areas that are more spread out than Atlanta," said Robert Poole, co-author of the policy brief and director of transportation studies at Reason Foundation. "Places with well-developed, highly-used rail transit systems – places like London, Paris, and Hong Kong – have radically higher densities than Atlanta and have city centers that are the center of the region’s business and retail activity. Most people in the region do not work or shop in downtown Atlanta." "Instead of trying to copy European or Asian rail systems that can't be recreated in Atlanta, officials should be looking at the transit system most suited to their reality: buses. Atlanta should look to bus rapid transit and express toll lane busways that could provide the time-savings and efficiency that might actually lure people out of their cars." I recently rode the 550 bus to jury duty in Downtown Seattle. It was fast, clean, comfortable, efficient and dropped me off 1 block away from my destination. We concur. Take a look at the information provided by guys with transportation and planning PHDs at truthabouttraffic.org. They report that the projected share of light rail trips by 2030 will only be 1.3% (assuming we approve the vote)! 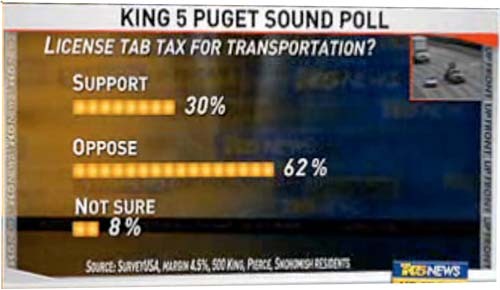 For this Sound Transit want us to spend HALF of our transportation tax dollars? "As the campaign season approaches on a transportation ballot measure, an advocacy group called the Washington Traffic Institute has formed to oppose Sound Transit's plans to expand light rail." Upfront with Robert Mak this week focused on the RTID and the many problems it faces as the development lobby steers it toward the polls in November. As per usual with RTID media coverage, Mak mistakenly framed the package as a "plan to improve your commute," which is of course the farthest thing from the minds of the promoters. Maybe someday one of these reporters will get it right and frame it as a "plan to enable development, and attract new residents." Whatever the case, it may just be that the voters have finally wised up, and realized that the taxes they paid for a widened I-90 simply resulted in a gazillion homes on the plateau, not a better commute, and won't fall for it again. 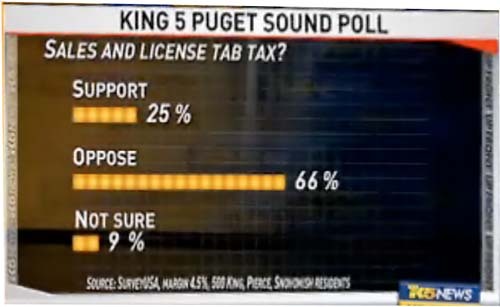 Folks, you may have heard the new radio ad on KVI 570 or other local stations that discusses the lack of actual congestion relief that would be provided from the Sound Transit Light Rail package. 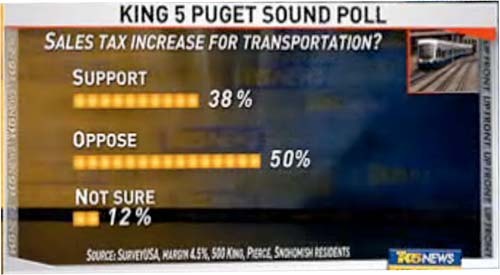 Remember, the Puget Sound Regional Council (PSRC) advocates for using HALF of our transportation tax dollars to increase the transit ridership from 3% to 4.5%. Doesn't that expenditure of public funds seem a little disproportionate and inefficient compared with the actual congestion relief provided? What about the rest of us, the 95% of us, that still would be using our cars to pick up groceries, get to jobs NOT located in Downtown Seattle or Downtown Bellevue, or transport kids and heavy goods? “We do not believe we should be spending transportation mega-dollars in an attempt to change human behavior,” Horn said. "Light rail’s geographic coverage is limited in comparison to the diversity of origins and destinations of travel. 1. Not enough people will ride light rail to make any difference on the roads. 2. Even Sound Transit admits that light rail will not reduce congestion; the train simply provides an alternative for the small fraction of travelers who find it convenient for their trip." "To be specific, real congestion reduction should be a primary goal. The metropolitan region of Atlanta, Georgia has recently mandated that 70% of the weighting in the evaluation of their alternative should be for congestion reduction. The Puget Sound region should follow that example." We need to spend the transportation dollars we have, which are finite, to provide actual, cost-effective congestion relief that will move more goods and people. Our regional taxpayers do not have unlimited funds just to waste billions in order to provide a possible increase of 1.5% in ridership, especially when it will not help 95% of the rest of us get where we need to go.